Marco and the Devil’s Bargain ($14.95, 256 pp., ISBN: 978-1-60381-229-0) is a new historical romance by Carla Kelly that takes place at the end of the 18th Century, during the decline of the Spanish Empire in the New World. A brand inspector and his wife fight the scourge of smallpox by bravely venturing onto the Staked Plains, stronghold of the Comanche. As part of a devil’s bargain, they must put themselves at the mercy of these dangerous enemies and try to inoculate them, also a risky proposition. 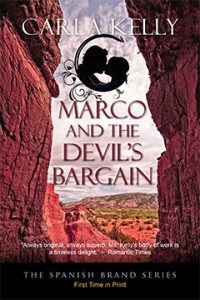 Marco and The Devil’s Bargain follows The Double Cross as the second book of Kelly’s all-new Spanish Brand Series. The trade paperback of Marco and the Devil’s Bargain is distributed by Epicenter Press/Aftershocks Media. Kelly is the recipient of two RITA Awards from Romance Writers of America for Best Regency of the Year; two Spur Awards from Western Writers of America; a Whitney Award for Best Romance Fiction, 2011; another Whitney for Best Historical Fiction, 2012; and a Lifetime Achievement Award from Romantic Times. Grade A: “To begin with, Marco and Paloma are a wonderful couple. They know each other very well, and in spite of not reading the first book, in which their characters were initially developed, I came to know them well too. Paloma is a strong, sweet woman, perfectly suited to her honorable, Spanish husband. They are both at their best when they’re together—not because they get outrageously maudlin when apart, but rather because they work as a team when they’re together, supporting each other as all good couples do. However, if Marco and Paloma were the only two characters I loved, this book would only make it to B+ territory for me. What made Marco and the Devil’s Bargain a DIK for me was the cast of secondary characters. Every single one of them, from Anthony Gill down to the Comanches Marco and Paloma met, was amazingly complex and realistic. I cannot think of the last time secondary characters seemed so vivid to me. There are some series which need to be read in order if they are to be understood. Carla Kelly’s Spanish Brand series is not one of these. Although I didn’t read The Double Cross first, as I should have, I still managed to fall head over heels for Marco and Paloma. To me, that is a good testament to Ms. Kelly’s amazing writing. I can’t wait to get my hands on another one of her books.” Read more …. 5 Stars: “What a wonderful adventure this book is! Marco’s and Paloma’s love for each other has grown, and they express it enthusiastically and regularly, though not too explicitly…. Carla Kelly has written another masterpiece about a time and place you don’t typically read about in a historical romance. Her descriptions are vivid, and she doesn’t shy away from the unpleasant aspects of how hard life was then. Her characters are well rounded, and interesting. The plot is exciting, and has a couple twists at the end that I didn’t see coming. This amazing story truly satisfies a love of both romance and history and I recommend it most highly.” Read more …. “I found this book a pleasure to read, the characters well-formed and credible. Her knowledge and understanding of the era are excellent. I look forward to her next in the series. Highly recommended.” Read more …. “Kelly’s ability to transport the reader into the unsettled Spanish territory of New Mexico is remarkable. From the daily life on the ranch to the travels into the wild, every word and action is well researched and natural…. With historical events such as smallpox and Native American threats and alliances driving the plot, Marco and the Devil’s Bargain is a well-rounded story that is sure to please.” Read more…. The year is 1782. Marco Mondragón, brand inspector in Spanish New Mexico, and his wife Paloma Vega have settled happily into married life on the Double Cross. And yet Paloma is convinced their joy will not be complete until she has a child. She longs to give her husband a baby to soothe his grief over the death from cholera of his first wife and twin sons. Marco’s land grant stands at the edge of the most dangerous region in the Southwest: Comanchería. Both Paloma and Marco have suffered at the hands of the fierce Comanche, losing beloved family members in raids. Despite their fear and mistrust of the Comanche, one lives among them. Paloma rescued Toshua from slavery and near death. As much as she respects the man now, Paloma wishes he would return to the Staked Plains, Comanche stronghold to the east in Texas. No one knows why Toshua remains at the Double Cross. Is it because his own tribe shunned him, or is he genuinely attached to its owners? Now a new enemy threatens the Mondragóns’ domestic bliss: the Dark Wind—la viruela, smallpox—barreling down on the defenseless royal colony from Comanchería. A mysterious and arrogant English physician named Anthony Gill offers their one hope at salvation … but only if Marco agrees to his Devil’s Bargain. A well-known veteran of the romance writing field, Carla Kelly is the author of thirty-one novels and four non-fiction works, as well as numerous short stories and articles for various publications. Carla’s interest in historical fiction is a byproduct of her lifelong study of history. She has a BA in Latin American History from Brigham Young University and an MA in Indian Wars History from University of Louisiana-Monroe. Click here to find Carla online. He must have noticed her hesitation, because he calmed himself, even as she watched. He took her hand and it trembled in hers. Alert now, wary even, she watched his expression change into precisely that look of false good will that she had been thinking of practicing on him. This would never do. She grasped his hand and tugged him down the hall into Luisa Gutierrez’s sala, which she knew was empty now, all the knitters gone. He did not resist as she towed him along, a little woman dragging a tall man who put up no resistance. Good thing the governor could not see his juez de campo now. He tried to smile, then obviously gave it up as a bad business. She could almost see him thinking something through; she knew him that well. Paloma closed her eyes and felt herself melt like butter, so great was her relief. “Gracias a Dios,” she murmured, and touched her forehead to his shoulder. She opened her eyes and looked at him again, mystified by the expression of vast disquietude. Surely he should be happy at this news. True, inoculations themselves could be dangerous, but that was a chance everyone took. There must be more. She put her fingers to his lips, stopping the flow of words. “What else?” she asked again. He leaned back against the wall, something he seldom did, this man who sat so straight, as though he were always in the saddle. He banged his head gently against the wall with increasing force until, horrified, she put her hand behind his head to cushion the blows. He stopped. “What is he making you do?” she asked.